Strong third-quarter demand benefited some brands more than others. 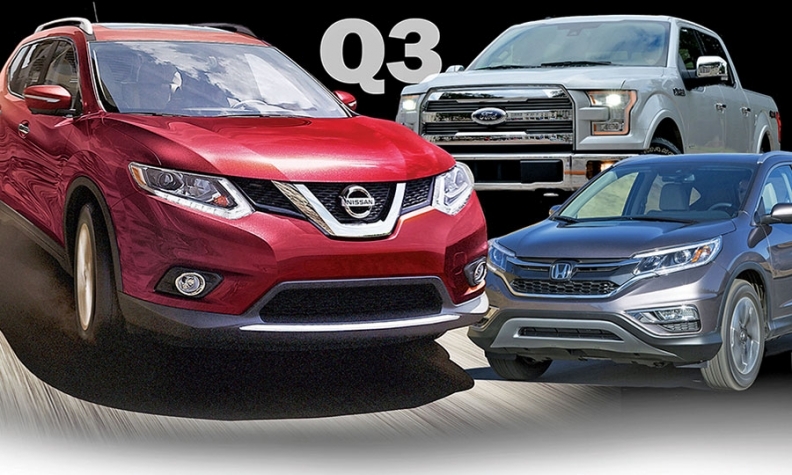 Shown above are the Nissan Rouge, left, the Ford F-150 and the Honda CR-V, all strong sellers in September. The U.S. auto industry's sizzling summer appears not to have quenched demand -- a sign that today's sales numbers are being achieved without many of the sins of the past. As an indication that automakers aren't overproducing, making high sales to rental-car fleets, jamming dealers with inventory or relying on outsized incentives, transaction prices continue to edge up even as volume increases. And if anything, dealers are calling for more supply. Dealer Greg May said his Chevrolet store in West, Texas, was held back by a shortage of vehicles in September. "I need more cars," he said. But it was a super September. New-vehicle sales soared a stunning 16 percent last month to 1.4 million cars and light trucks, thanks to a robust Labor Day weekend and further strong demand for pickups, cross-overs and vans. Practically all automakers reported double-digit percentage increases. Among the top manufacturers, Ford Motor Co. led with a leap of 23 percent. The gains for Toyota Motor Sales, Nissan North America, American Honda, Fiat Chrysler Automobiles and Hyundai-Kia ranged from 13 to 18 percent. At General Motors, sales rose 13 percent, but that was held back by a drop in fleet sales. On a retail basis, GM's volume climbed about 17 percent. The Volkswagen brand sold 26,141 vehicles, just 145 more than a year ago, as it was forced to stop selling 2.0-liter diesel models amid its emissions scandal and leadership shake-up. A closer look at the numbers suggests VW is starting to feel an impact. Sales of the Golf and Jetta sedan, the two highest-volume diesel models, fell 37 percent and 14 percent, respectively. The seasonally adjusted annualized sales rate came in at 18.17 million vehicles, topping August's 17.81 million and marking the highest level since July 2005, when employee-pricing discounts drove the SAAR to 20.64 million. The steady pace of high sales in recent months reflects the strength of U.S. consumer demand and the healthy conditions auto manufacturers have created in the wake of the Great Recession. "We're in a very good, vibrant economic backdrop for vehicle sales," said Mark LaNeve, Ford's vice president of U.S. marketing, sales and service. He noted that almost all drivers are working in the industry's favor -- gasoline prices and interest rates are low; housing starts, consumer confidence and the age of vehicles on the road are up. Big gains such as September's no longer can be explained by one-time factors such as calendar quirks or new-model launches. LaNeve and other industry executives said sales were brisk all through September. "It was more than Labor Day," LaNeve said. In fact, the SAAR has hit or exceeded the 17 million mark for five months in a row now, a feat last accomplished when the industry enjoyed a 12-month streak from July 1999 to June 2000. Overall, truck sales rose 24 percent last month and made up 58 percent of total sales. Just two years ago, trucks made up 50 percent of the market. The rapid shift is putting strains on manufacturers. GM and Ford said they generally are satisfied with their inventory levels, but Toyota expressed concern about supplies running low. While the Toyota brand's car sales increased 19 percent in September, it reported that sales of the recently redesigned Tacoma midsize pickup fell 3.2 percent and the larger Tundra saw a 7.9 percent drop. With the SAAR running above 17.5 million for four out of five months, "there's going to be gaps in every manufacturer's lineup," Bill Fay, general manager of Toyota Division, told reporters on a conference call. "When the market shifts that much, we're all reacting the best we can." Perhaps as a further exclamation point on how the industry seems to be firing on all cylinders, even Scion saw a big gain. Scion had reported sales decreases 27 months in a row. But the new iA and iM drove volume up 57 percent in September to 6,510 vehicles.